Gun filling fast Alu H.T. The Duet RTF by Hobbyzone is a small indoor/parkflyer twin-engine aircraft designed for beginner drivers. It comes complete with remote control. The landing gear is removable to facilitate landing on grassy ground. RTF VERSION: NOTHING TO ADD. Here is the latest model in the HobbyZone FireBird DELTA RAY in BNF version range.Finally a flying wing within the reach of beginners through the stabilisation SAFE system. Its battery Li - Po 1300mA ensures great autonomy. Ready to apairer with a spektrum remote. You have never flown in before RC or you simply made a flight with a multi-engine drone, the revolutionary Carbon Cub S +. 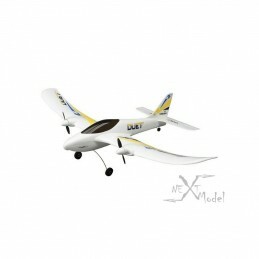 is the RC plane the more versatile, more capable and easier to fly. Scale approx. : 1300 mmOverall length, approx. : 865 mm Comes complete with remote control, battery, and charger.